For as long as I can remember, my mind has been a hornet’s nest of thoughts, worries, stories, alternative timelines in which I live the dream and face the consequences for daring to do so. It gets to be maddening every once in a while. To calm the hornets to a dull buzz, I often take brisk long walks, always alone, except today. There’s a saying you grow accustomed to when you live in El Pueblo de Nuestra Señora la Reina de los Ángeles del Río de Porciúncula: straight out of Central Casting, which applies to a person who happens to strongly match a particular stereotype. My guest on today’s journey was Christ on a bike. The man, in his thirties, kept pace with me on his bicycle for a bit before flagging my attention, as I was otherwise occupied by my trusty dusty travel companion, ye olde iPod. Before he said a word, my first thought was, Man, he looks just like the actor who played Jesus in that Son of God film. Long hair. Mustache and beard that teetered on the edge of becoming unkempt. No white robe, though, this cycling prophet rocked a denim shirt and jeans, but he did pedal in open-toed sandals. Yes, I’ve read the Bible, but I can’t quote chapter and verse. No, I haven’t accepted the Lord into my heart, just as I don’t take in any of the other belief systems I don’t embrace. Yes, I’ve heard the saying, the greatest trick Lucifer ever pulled was convincing the world he didn’t exist. Clearly, the standard approach wasn’t working, so Jay switched gears and attempted to relate to a wretch like me. Turns out he, too, had fallen from the path of righteousness, lost his way and his faith in The Almighty, and it wasn’t until he was in his thirties (thirty-three, perhaps?) that a man approached him in a similar manner, directed by God to save a particular soul. Not once, but thrice did Jay try to stop me in my tracks and get me to pray with him in order to receive an instant release of all the burdens in my life. And like Peter, I denied him three times. “I believe I’m not smart enough.” I answered, as I always did whenever anyone bothered to ask. But it’s a poorly constructed answer that required clarification. I should change it, but it had become an almost automatic response at this point. That, and I’m just too damned lazy to do so. I, myself, am a non-spiritual entity who believes that when it comes to the origin of things–the universe, life, etc.–that I am simply not smart enough to know the truth. And when I say I, taking the full weight of ignorance upon myself, I actually mean we as in mankind or peoplekind or whatever passes for politically correct phrasing nowadays. This does not, however, mean that I do not applaud attempts to gain answers, I’m just not satisfied with any of the options presented to date. And that’s not just with religion. Creationism versus evolution? I’ve got no dog in that fight. I proudly ride the ignorance fence when it comes to our humble beginnings because, in my opinion, religion and science both offer up a series of theories yet to be proven as fact. You believe differently? Good on you. I sincerely hope that works out for you, sincerely hope you’re right, and sincerely hope you receive your reward for being righteous. I’m not in the habit of knocking people’s spiritual beliefs. It’s none of my concern what system you choose to embrace, and with all due respect, I couldn’t care less who or what you worship. Totally your business and I’m cool with it all, especially if it gives your life some sort of balance and leads you to do no harm. This isn’t to say that I don’t find the Bible a fascinating read, but I view it as–again, no offense intended–mythology. Same as with Greek, Celtic, Aztec, African, etc. writings that deal with the human experience in relation to the worshiping of gods. I also enjoy apocryphal and pseudepigraphal texts, all of which eventually finds its way into my work. Jay didn’t agree with a lick of this blasphemous nonsense and after a good forty-five minutes of loggerhead debate, he gave the “stop and pray with me” one last-ditch effort. 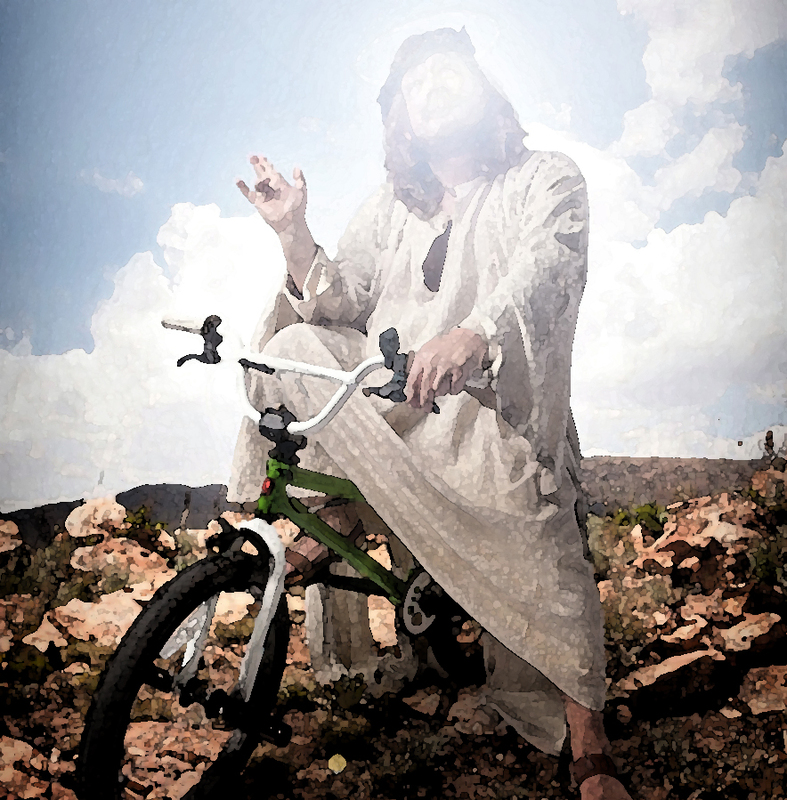 When I refused, he gave me God’s blessing and cycled off politely as he arrived. So, in honor of the noble efforts of Jay, today, I urge you all to sally forth and be true to your own belief systemingly writeful (and should you wish to add this sinner to your prayers, I surely won’t stop you). This entry was posted in Musings and Miscellanea, Uncategorized and tagged creative writing, rhyan scorpio-rhys, scorpio-rhys, short story, short story writing, spinning yarns, tweet fiction, weaving words, writer, writing. Bookmark the permalink.